We have 4 tickets per show, per day. 2 adults & 2 children or 1 adult & 3 children. Courtesy of Gandeys Circus & Helping Hand, charity to the Royal Belfast Hospital for Sick Children. This one hour show features international circus artistes from Mexico, Ukraine, Switzerland and Europe. Packed full of comedy from Chico Rico, Europe’s super star clown, plus thrilling circus acts. Specially created, costumed and choreographed to be Belfast’s must see show this Christmas. 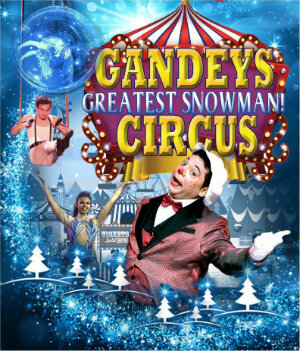 Set in a 600 seat fully floored, carpeted and heated theatre big top, it’s our guarantee you won’t be.. Frozen… this Christmas ..or will you ..watch out for our Greatest Snowman in a sensational circus for the whole family! We are extremely grateful to Gandeys Circus for the opportunity to be able to offer these tickets to our supporters. They’ve also kindly agreed to a bucket collection for the charity at the end of each show and we would be very grateful for your help with this.